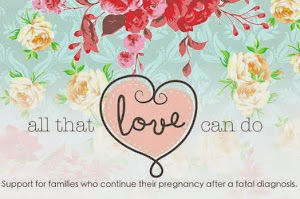 If you have received a poor or fatal prenatal diagnosis, you may feel robbed of spending time with your baby. But it's never too early or too late to make precious memories even while pregnant. Babies can start hearing in the womb as early as the 16th week of pregnancy. So talk to your baby as often as you can. Tell him how much you love him. Tell him about your life. Tell him your secrets. Tell him everything you want him to know. If talking to your belly doesn't come easily, consider reading to your baby. Maybe pick out a special book, or you can read poetry or Bible passages. Make sure if you have a special book or Bible to take it to the hospital with you. You can read it to your baby after she's born, or stamp it with her foot print. You can also sing to your baby or play soothing music. Consider making a CD of your favorite songs to play for your baby. Another way to create memories is to take your baby to all the places you want him to experience. While still pregnant, go to the beach, church, the place you and your husband met or got married, the movie theater, the park, a garden, and anywhere else you find special or significant. Describe the place to your baby. She can't understand your words, but she can sense how you feel. Also, if possible, take pictures of you and your pregnant belly and write the dates on the back. That way later you can add them to a memory book and remember all the places you and your baby went together. If it's something you're interested in, take maternity pictures... they don't have to be professional, but you may want to consider having professional ones taken by a photographer who specializes in maternity photos. Also, you might want to get a 4D ultrasound video made. Some places also offer to record the baby's heartbeat as well. Also, make sure to ask your doctor if they can take some ultrasound photos for you to keep. Lastly, consider making something special for your baby. If you know how to, you can knit a blanket or a hat. If you're not crafty, you can buy iron-on patches and letters and decorate a blank onesie or a blanket. You can also make a prayer flag, a pregnancy scrapbook, or a small baby bracelet with letter beads. For other ideas and inspiration, take a trip to your local craft store or look for tutorials and pictures on Facebook and Pinterest. 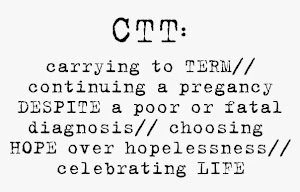 Part of the joy of CTT is the opportunity to cherish the days, weeks or months that your baby is alive and well in your womb. It will never feel like enough time, but if you make an effort to treasure this time together, you will create a lot of special memories, and you can look back knowing that you celebrated life with your little one. The memories you make while pregnant will be extremely valuable later, even if it doesn't seem like it now. Though it may be difficult to muster enough energy to enjoy your pregnancy, try your best to do as much as you can and always remind yourself that your baby's life is meaningful and significant to the world, no matter what.